Alpine, subalpine. Streamsides, wetlands. Summer. If, high in the mountains, not long after the snow has melted, a startling magenta arrests your eye, you have been caught by Parry’s Primrose. Its color is intensified by the contrast with its own bright green leaves. 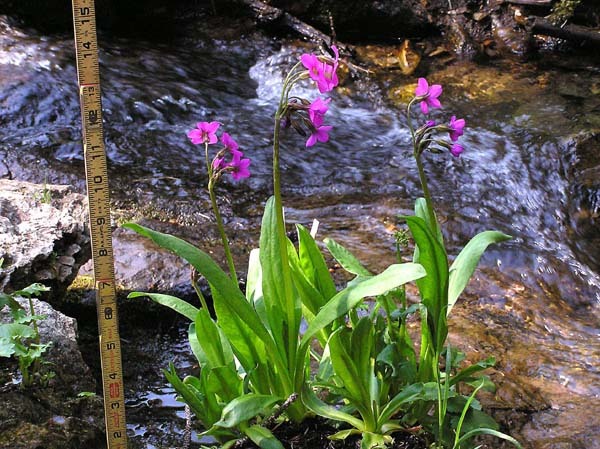 Parry’s Primrose loves to have wet roots so it is found on waterfall ledges, snow-melt areas, streamsides, and swamps. It is often scattered in extensive patches of white flowering Marsh Marigolds. But Parry’s beauty does have its limits; just lightly touching the plant will bring out a most unpleasant fetid odor.